Your Daily Cute: Cow-Cat Momma and Her Cow Kittens Need an Angel! It's not very often that I use the Cute to beg... but every once and a while, a group of kittens or a special cat just gets to me. This is one of those times. 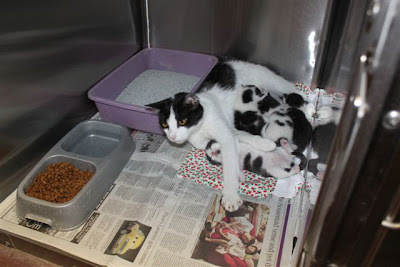 A rescue needs to pull them, but what we really need is a foster for them to go to. If you can take them -- and you are ANYWHERE -- let me know and we'll see what we can do and if there's any way to get them out alive and to you. They don't have long! Just look at these faces... Below is the post directly from the shelter. I am not sure how much time they have left, so if you can help them, please speak up ASAP! And even if you can't, please share this post. Let's get these sweeties out of there safe and alive! "Can you get over these little Cow pies? 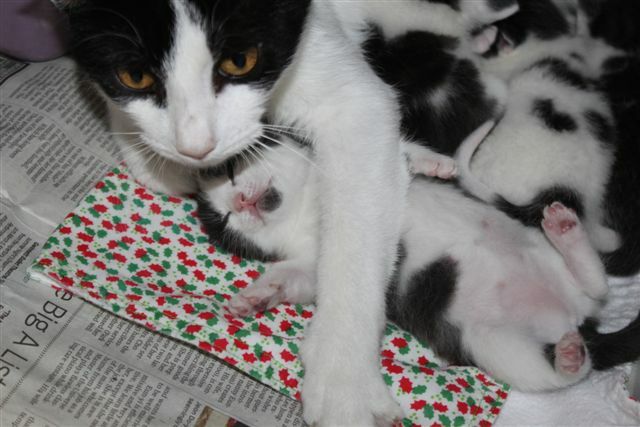 Look at the one under her arm......she adores her babies and snuggles them up close to her. She has 4 little cow spotted kits, and she is a young thing herself. This girl is VERY sweet and loving. 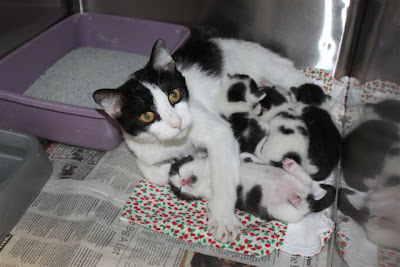 Please give her a second chance, and help her babies live safely. For all other information regarding ordinances, county codes, and other functions of Henry County Animal Care and Control please visit www.hcacc.org"
UPDATE Sun, 5/22: As of yesterday, this family is still alive in the kill shelter. Am working with a couple people to see if we can get them out (hopefully) tomorrow and get them somewhere safe. No definite news yet. I'm not even sure if they're still there since no one asked today. If they are there, it's getting too close to comfort! I wish I was local and could go scoop them up myself. Keeping paws crossed still! UPDATE Fri, 6/3: Best of my knowledge these babies are still alive. They were 2 days ago anyway. I have rescues that can pull them, people who will help fund raise, but no final destination for them to go to. :( What we need is a foster in Georgia or a miracle! Please keep sharing. I sure will be purring for them! Unfortunately the lack of permission to use the pictures makes us unable to distribute to our 10,000 twitter friends and almost 2000 facebook friends. Good luck beautiful ones. If there is any way to get them to me I can take them. I am in Utah, though. I have no idea how that would work. I will pass on the message. Brian, I think you can post my blog page to Twitter and Facebook, but just not the pictures directly. Robin from Covered in Cat Hair does it all the time and she speaks with them directly. If you could share, it would be great! Look at the posts up above. There are 2 people wanting to help! Please someone repost to let us know this momma and crew are safe! I'm full to the top and in Washington state or theywould already be out! LeAnn - thank you so much! Messaging back and forth on FB and talking to the people I got the info on. Hopefully we can get them out in time! Thank you! The woman below is in Georgia, so I am going to see if there's a way that can work. If not, I'll try and work the next options! Its' tough, though, these poor babies don't have much time at all I don't think. Paws crossed! Any news? Have they been rescued??? Paws still crossed, Leslie! There are a couple steps and a couple things that need to get checked out and verified, but I've been back and forth with some people who can probably help. There's another woman working on them, too, so I'll let you know ASAP as soon as I hear! I still have hope! Who wouldn't love their very own tiny herd of cow-kitties?!? Any news? Are they safe? I'm not sure, Ruthie. I was asking today. I will be sure to keep you posted. I will take all if you haven't found a permanent home for them yet. just let me know. Katie, I'll email you tomorrow if anything. Thank you! Where are you located? we still have our paws crossed...any news? Do we have an update on these babies and their momma? I'm going to check up again tomorrow. There was a foster application going, but I'm not sure if there was enough time to get it through. I hope so! Did they make it out? 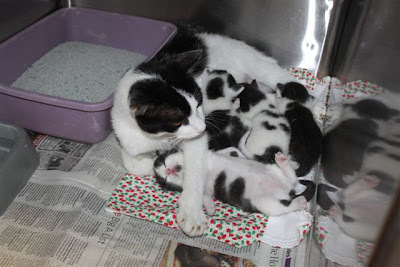 Just found out momma and her kitties are STILL alive, but still at the shelter. I haven't been able to coordinate anyone to get them out, so if you happen to have any ideas... Or just keep passing them on! Do you have someplace for them to go if they can be pulled? I might be able to find a puller but they will need someplace to go. Do you think your contacts might be able to find a foster? I am in NY so can't do any transport myself, but since some animals are being transported from GA up to NY and MA I think we can do a few hours. And if we can raise money for LeAnn that would probably be best. GA is a pretty high kill state and with kitten season space is at a premium. Of course having money for the vetting does help when deciding who to save. I posted it on the kitty rescue club - let's see what shakes out. Thanks! Do you have a link to that? What is the status of cow mamma and her sweet babies? If I could get to them, I'd take the whole family in a hot second. I haven't been able to sleep tonight just thinking and worrying about that little cat family's status. I live in Arizona or I would have gone after those little darlings the first time I read about them. I am praying really, really hard that someone or some rescue group has been able to rescue that sweet family. The cow kitties and all cats that you help to save our a god's little blessings for sure. People likeyou that really cares mean so much. I too love animals as I grew up on a farm in British Columbia. To all people out there please learn to care for our animals a whole lot more. When you don't care your also not caring about human beings too. Stop all animal abuse. Learn how to LOVE all creatures big and small and especially learn to love and respect yourselves as you should to all the little animals in the world. Bless you all for the postings and so happy all the cow kitties are now safe and healthy.